Winstuff.co.nz, provides this site and services offered on it under the following terms and conditions of service and web site use ( Terms ); please read them with care. By using the Winstuff.co.nz site, registered web site(s) or registering to use the services offered you are stating that you have read and understood the Terms and agree to be bound by them. Winstuff.co.nz, reserves the right to terminate your account at any time, including if Winstuff.co.nz, learns that you have provided false registration information or have violated the Terms. These Terms apply to all Winstuff.co.nz domains or sub domains or any URL on the Winstuff.co.nz domain. 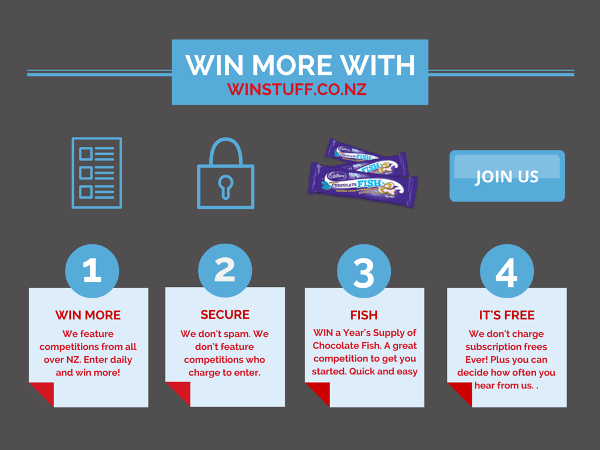 Winstuff.co.nz, reserves the right to modify the Terms from time to time. We will keep you informed of these changes by posting a notification on the web site(s) home page. Your sole recourse will be to discontinue use of the web site(s). Continued use the web site(s) indicates your understanding and acceptance of the modified Terms. The content of this web site(s) is copyright of Winstuff.co.nz, and belongs to Winstuff.co.nz, or its licensors. All other intellectual property rights are reserved. Certain of the names, logos and other materials displayed on the web site constitute trademarks, trade names, service marks or logos ("Marks") of Winstuff.co.nz, or other entities. You are not authorised to use any such Marks and ownership of these Marks and the goodwill thereof remains the property of Winstuff.co.nz, or those other entities. The availability of the content on Winstuff.co.nz does not confer on any person any rights in such content other than as set out in these Terms. In particular no legal identity may reproduce or distribute the content or any proprietary information without the prior written permission of the owner. The content of this site is protected by all relevant laws applicable thereto and the persons to whom the contents hereof come are specifically prohibited from modifying, publishing, transmitting, selling, participating in the transfer or sale or reproducing, creating derivative works from, distributing, performing, displaying or in any way exploiting any of the materials on this site or the software or materials relating thereto in whole or in part. Any material on the web site is for the personal use and information of the person to whom it comes, and must not be used for commercial purposes. Winstuff.co.nz, will initially only service New Zealand, excluding certain out of the way areas. Access will be available to the web site internationally. To the fullest extent permitted at law, Winstuff.co.nz, is providing this web site and its contents on an "as is" basis and makes no (and expressly disclaims all) representations or warranties of any kind with respect to this web site or its contents including, without limitation, warranties of merchantability and fitness for a particular purpose. In addition, Winstuff.co.nz, does not represent or warrant that the information accessible via this web site is accurate, complete or current. Winstuff.co.nz makes no warranty that the contents of the Winstuff.co.nz website is compatible with all computer systems and all users of this site use same at your own risk. No liability for any loss or damage or expense arising from the use of this site shall attach to Winstuff.co.nz. Price and availability information is subject to change without notice. Except as specifically stated on this web site, to the fullest extent permitted at law, neither Winstuff.co.nz, nor any of its affiliates, directors, employees or other representatives will be liable for damages arising out of or in connection with the use of this web site. This is a comprehensive limitation of liability that applies to all damages of any kind, including (without limitation) compensatory, direct, indirect or consequential damages, loss of data, income or profit, loss of or damage to property and claims of third parties. Winstuff.co.nz disclaims any liability which might arise as a result of this web site being used for any unauthorised material and any such person hereby indemnifies Winstuff.co.nz against any loss or expenses suffered by them as a result of your actions or omissions. Winstuff.co.nz shall not be liable for any loss or damage, whether in contract, tort or otherwise in connection with the use by any legal identity of this web site. Winstuff.co.nz accepts no liability for any non-availability, inaccuracies, defects, loss of data, or any financial or other losses resulting from the use of the content or failure (or part failure) of the content to be suitable for the purposes for which it is required. Any opinions, advice, statements, services, offers, or other information or content expressed or made available by third parties, including information provided by other users of the Winstuff.co.nz, web site(s), are those of the respective author(s) or distributor(s) of that information and not of Winstuff.co.nz. Winstuff.co.nz neither endorses nor is responsible for the accuracy or reliability of any opinion, advice, information, or statement made on the web site(s) by anyone other than authorised Winstuff.co.nz spokespersons while acting in their official capacities. Winstuff.co.nz has the right, but not the obligation, to monitor and review the content on the web site(s) and your account to determine compliance with these Terms and any other operating rules established by Winstuff.co.nz, to satisfy any law, regulation or authorised government request, or for other purposes. You understand and acknowledge that Winstuff.co.nz is not obliged to monitor content for accuracy or reliability. Your correspondence or business dealings with, participation in promotions of, or purchase of goods and/or services from Winstuff.co.nz, partners, advertisers or sponsors found on or through the Winstuff.co.nz web site(s), including delivery of goods or services, and any other terms, conditions, warranties or representations associated with such dealings, are solely between you and such partner(s), advertiser(s) or sponsor(s). You agree that Winstuff.co.nz shall not be responsible or liable for any loss or damage of any sort incurred as the result of any such dealings, or as the result of the presence of such partners, advertisers or sponsors on the Winstuff.co.nz, web site(s). Winstuff.co.nz, assumes no responsibility for the contents of any other web sites to which the Winstuff.co.nz, web site(s) has links and shall not be held responsible or liable for any loss or damages caused or alleged to have been caused by use of, or reliance on, any content, goods or services available on such hyperlinked sites. Winstuff.co.nz, may not have control of such web sites. The inclusion of any hyperlinks to such other web sites does not mean that Winstuff.co.nz, endorses the material on such web sites or has any association with the owner(s) thereof. You are solely responsible for maintaining the confidentiality of your username and password, and the activities that occur under your username and password. You agree to immediately notify Winstuff.co.nz, of any unauthorised use of your username and password, or any other breach in security. Winstuff.co.nz cannot and will not be liable for any loss or damage arising from your failure to adequately safeguard your username and/or password, or to otherwise comply with this section. You agree that Winstuff.co.nz, in its sole discretion, may terminate your password, account (or any part thereof) or use of the web site(s), and remove and discard any information posted by you on the web site(s), for any reason, including, without limitation, if Winstuff.co.nz, believes that you have violated or acted inconsistently with the letter or spirit of the Terms. You agree that Winstuff.co.nz, may terminate your access to the web site(s) without prior notice, and you acknowledge and agree that Winstuff.co.nz, may immediately deactivate or delete your account and all related information and files in your account and/or bar any further access to such files or the web site. Further, you agree that Winstuff.co.nz shall not be liable to them or any third party for any termination of your access to the web site. You may discontinue your participation in and access to the web site(s) at any time. This document embodies all of the Terms and you may not rely on any representation, promise, or any understanding not expressly set forth in these Terms. No failure or delay by Winstuff.co.nz to exercise any right or remedy under these Terms shall be or be deemed to be a waiver thereon. If any term of these Terms or any part thereof shall be or be declared illegal invalid or unenforceable for any reason by a Court of competent jurisdiction, such terms or provisions shall be divisible from the balance of these Terms and shall be deemed to be deleted. Any and all contracts formed between Winstuff.co.nz and you will be interpreted, construed and enforced in all respects in accordance with the laws of New Zealand. You irrevocably agree to submit to the exclusive jurisdiction of the New Zealand Courts.